The Lion is called the King of the Jungle for good reason. They are nearly unchallenged for the throne at the top of the food chain. The killing machines are not to be toyed with as they can regularly take down animals over twice their size. Still, there is much you might not know about these beautiful animals so today in our Wonders of the World segment we are going to present you with a few facts that you might not know about lions. #1 It's all about territory. Lionesses don't wander far from the area that they were born in. In fact, they spend their entire lives living in the area that the previous generation controlled. Male lions, on the other hand, move about freely searching for different prides to breed and intermingle with. Male lions actually spend most of their life alone which makes sense since they are such efficient hunters. #2 The tragic truth of pride turnover. When a male lion takes over a new pride they kill all of the offspring that the lionesses have. They will often force many other members of the pride to run away and leave the pride. This is often a death sentence as most lionesses are not strong hunters outside of a group. Males often join up with other males outside of their pride and form partnerships. Most people might think that the number of lionesses in a pride determine how healthy it is but the truth is that more males mean that the pride is stronger and healthier than others especially when it comes to reproduction. #4 Different names for different groupings. You may have heard that a group is lions is known as a pride but that's not technically true. A group of lionesses who live together and are related is actually a pride while a group of male lions is called a coalition. #5 There is always somebody badder. Lions are without a doubt at the very top of their food chain but there is one animal that lions will downright refuse to attack if at all possible. That's right the big bad lion is actually afraid of one animal, the porcupine. With those sharp quills, lions often think twice before they jump on one. #6 The tale of the tail. Lions use their tails to send messages and signal warnings or instructions to members of their pride. They are much more sophisticated than most people realize. Lions have very powerful sharp claws on their paws. These claws are made even more useful by the fact that they are retractable. Since their claws can retract they don't run the risk of injury while they are playing as cats often do. #8 The meaning of all that roughhousing. Lions leave scent marks on other lions by rubbing against them just like most other cats. Lionesses and Lions also greet one another with rough play. It might look like they are aggressively fighting with each other but they are actually just saying hello. 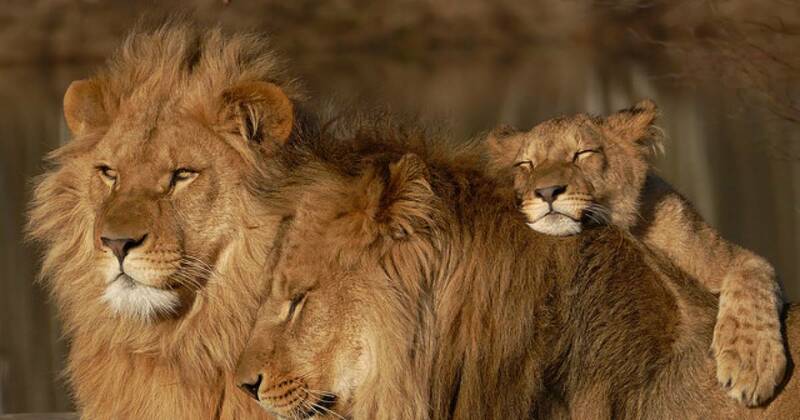 Now check out this wonderful video of a family of lions together.